In the vast Rust Flats lies the remnants of a ruined city of Ork. Stories are told of a huge empire that ruled the Five Lands and the lands beyond the Dry Sea. Many legends are told of the abundant riches of the Burned Empire, but most of them were lost in the War of Fires. Still, some remains of the empire’s great wealth lies in the ruins of its forsaken cities. Even though the Rust Flats and the ruins are known to be dangerous places, a few treasure hunters, pilgrims and such are dauntless enough to pursue the lost riches of the Burned Empire. Cannibal clans are only one of the dangers in the ruins of the city of Ork. Usually the inhuman cannibals hide in their underground lairs somewhere inside the maze-like ruins. Cannibal clans are typically small communities comprising of a single large or multiple related families. Clans are lead by a chief who is usually the strongest in the clan. The cannibals prey on scavengers, traders and treasure-hunters wandering in or travelling through the Rust Flats and try to capture their prey alive and take them to their lair to be stored and prepared for their horrendous fate. This dungeon is build into an ancient underground mall or a metrostation. Most of it is collapsed or flooded in water. The underground river south of the dungeon is actually an old flooded metro tunnel. It is mostly used to dump the garbage and feces. The pool of water in the middle of the dungeon is a hole leading to a lower level that is now flooded. This is used as a well for the clan. Near the main entrance is the feasting hall. There is a bonfire here surrounded by many a skulls and bones. The “food” is stored in the rooms on the east and west side of the feasting hall. The slaughtering room is located on the lower west side of the feasting hall. People are slaughtered and prepared here. The room is filled with skinned and gutted carcasses hanging from the roof. 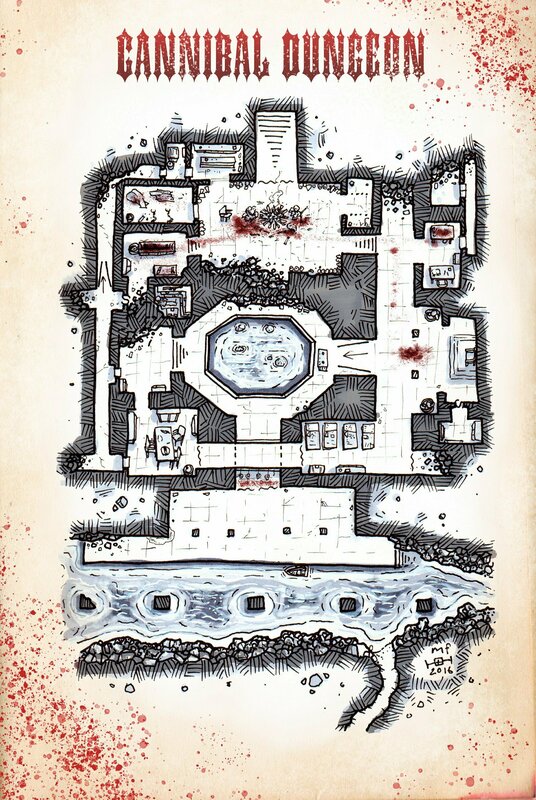 For different map versions and more RPG maps, please, check out my Patreon page and storefronts in DrivethruRPG and RPGnow. This map was originally published on Patreon with the support of my awesome patrons in March 2016.